The Spectrum Diet was created by Dean Ornish, MD, who is one of the first researchers to demonstrate that heart disease can be reversed by following a strict low-fat vegetarian diet. In this book he offers a diet and lifestyle program that can be adjusted to suit almost anyone. Ornish acknowledges that diets don’t work in the long run so he has developed a plan that involves a gradual approach to making healthier lifestyle choices. The program is designed to be adapted to suit your genetics, unique needs, and personal preferences. 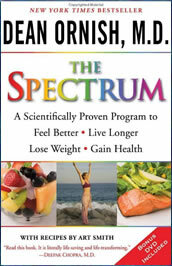 The Spectrum is basically an outline for a healthy lifestyle that you will tailor to suit your requirements. You decide the speed and degree to which you want to move along the healthy continuum. On The Spectrum Diet plan no foods are forbidden and you can eat anything you want. However the closer towards the healthy end of the spectrum, the greater your chance of a successful outcome, in regards to both weight loss and health. Foods are placed into categories from the healthiest (group 1) to the least healthy (group 5). Group 3: Seafood, refined carbs, concentrated sweets, oils higher in saturated fats, margarine. If you are already eating the bulk of your diet from groups one and two, and do not have any major health problems, you may only need to make a few changes. However if foods in group 5 form a large part of your diet it may be necessary to make a more significant dietary adjustment. Unlike the strict diet plans that Ornish is best known for, The Spectrum plan offers the dieter a great deal of flexibility. Small indulgences are permitted however dieters are advised to practice portion control. Guidance is provided on how to identify your health risks as well as how to customize the diet, fitness, and stress-management components of the program to suit you individually. Fresh fruits and vegetables, whole grains, legumes, low fat dairy products, egg whites, tofu, soy milk, avocado, nuts, seeds and herb tea. Look for other healthy recipes here. The Spectrum Plan advises dieters to undertake a combination of aerobics, strength training and flexibility exercises. Yoga is also recommended for its stress reduction benefits. The Spectrum retails at $27. Flexible plan that can be adjusted to suit individual needs and preferences. Gradual changes are more likely to result in a sustainable healthy lifestyle. Diet and lifestyle recommendations are based on scientific research. Acknowledges the role of stress management in weight loss and health promotion. Includes specific recommendations for high cholesterol, high blood pressure, type 2 diabetes, cardiovascular disease, breast cancer and prostate cancer. Dieters do not have to give up favorite foods. Includes 100 recipes created by Oprah’s award-winning personal Chef. Includes a bonus guided meditation DVD. Some dieters may have difficulty with the vegetarian and low fat aspects of the diet. Dieters may gain weight and experience other health issues if they do not stick with low glycemic index carbohydrates. Diet is very low in foods containing ‘good’ fats such as nuts and avocado. The Spectrum Diet will most appeal to dieters who are interested in weight loss as well as improving or maintaining their health over the long term. It is especially of benefit to dieters who are concerned about reducing the risk of heart disease. In contrast with Ornish’s previous books, The Spectrum offers a more flexible approach, and provides dieters with a great deal of choice in determining how to adapt the plan to suit their unique individual needs and goals.